Government says at least 49 killed and more than 1,000 arrested in violence as Egypt marked start of 2011 revolution. The death toll from clashes during protests in Egypt has risen to 49 in violence that erupted on the third anniversary of the popular uprising which toppled Hosni Mubarak. Nearly 250 people were wounded in Cairo and several other provinces during the demonstrations, the Health Ministry said on Sunday. The worst violence was directed at supporters of the deposed president, Mohamed Morsi, who staged dozens of rallies across the country. 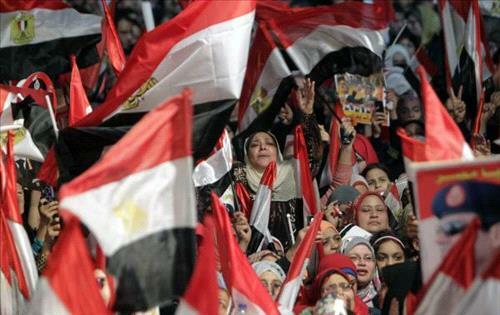 While thousands rallied in support of the army chief, General Abdel Fattah al-Sisi, who overthrew Morsi in July, others protested against the military-backed government, underscoring deep and persistent divisions. The Interior Ministry said in a statement on Sunday that it had arrested 1,079 “rioters” in possession of rifles, petrol bombs, fireworks, and other weapons. It said that a number of policemen were injured in clashes. Also on Sunday, four soldiers were killed and nine wounded when gunmen attacked a military bus that was travelling in the Sinai Peninsula, security sources said. The area is home to Ansar Bait al-Maqdis, an armed group that has said it carried out attacks in Cairo in the days before the anniversary of the start of the uprising against Mubarak’s 30-year rule. Sinai was the site of a reported attack on Saturday where an army helicopter was destroyed by rocket fire. The main pro-military event in Cairo’s Tahrir Square was peaceful, protected by a heavy deployment of soldiers and police. “We want to show that we won’t go back to the Brotherhood, and we won’t be scared by their terrorism,” said Mohamed Salama, entering Tahrir Square with a group of about 20 people. The interim president, Adly Mansour, is on Sunday due to deliver “an important speech” – possibly the calendar for presidential and parliamentary elections.